One of our personal favourites, this safari showcases the breathtaking scenery and the richness of wildlife in the world acclaimed parks of Tanzania’s northern circuit. Coupled with luxury accommodation this safari delivers the ultimate safari experience amidst the jaw dropping wildlife and landscape of Africa. No reviews yet for this trip. Browse other reviews below for Safari HQ . On arrival at the airport you will be personally met and escorted by one of the SafariHQ guides to your accommodation at the Arusha Coffee Lodge. Surrounded by endless acres of berry-laden coffee bushes in Tanzania’s largest coffee plantation, the Arusha Coffee Lodge is designed around the original plantation houses with luxuriant decor and stylish undertones of the bygone era. Your suite has been lavishly furnished and features a split level living area and a private deck with a fireplace. The chalets in this cozy and serene retreat, are nestled amongst the lush coffee grove to ensure privacy and solitude. The chalets have been designed with sublime luxury in mind for the ultimate in comfort and style. The aromatic coffees made here from meticulously hand-selected beans and specially brewed onsite at Arusha Coffee Lodge are sure to please even the most discerning of coffee connoisseurs. After breakfast, enjoy an adventure packed day of game driving in Tarangire National Park. This park is dominated by the perennial Tarangire River and is characteristically known for its giant baobab tress that stretch and wind their branches into the blue sky. The most spectacular feature of Tarangire is its large elephant population. In fact, it has the largest population of any park in northern Tanzania. These gentle giants abound in excess of 3,000. Tarangire is currently experiencing and elephant baby boom and you will notice a lot of juniors and babies as members of the herd. Also expect to see zebra, eland, mongoose, giraffe, bushbuck, hartebeest, dik dik, impala, warthog, reedbuck. Primates you may encounter are olive baboon, vervet monkey and bushbaby. Many carnivores are abundant throughout the park such as lion, leopard, cheetah, hyena and jackal. Retire to Tarangire Treetops to enjoy a sundowner while taking in the many colours of the setting sun over the Tarangire landscape. This morning you will enjoy a game drive through Tarangire National Park en-route to the picturesque Ngorongoro Conservation Area. Perched on an elevated crest of the Ngorongoro Highlands, with sunlight gleaming off its stately whitewashed buildings, lays the simply bewildering estate known as The Manor. Distinguished furnishings and expansive spaces beget an old-world class of luxury and comfort. Casual elegance is the theme here, with the charming ambience of a traditional African coffee plantation knitted with the stately grandeur and elegant opulence of the architecture. Today you will enjoy a full day of action packed game driving in the world famous Ngorongoro Crater. The Crater is a world heritage site and the world’s largest intact volcanic caldera and is commonly referred to as the 8th wonder of the world. The 2,000 feet high walls of the approximately 10 mile wide crater create a natural amphitheatre for the densest populations of large animals anywhere in the world. It is a microcosm of the African safari experience and in one day it is possible to see a staggering array of wildlife including all the big carnivores. With abundant and easily accessible wildlife the Ngorongoro Crater is truly awe inspiring with a strikingly majestic and sublime landscape. You will return to The Manor for evening cocktails and a sumptuous dinner. Today we make our way to the world famous Serengeti National Park and your luxury accommodation for the next 2 nights at Serengeti Migration Camp. 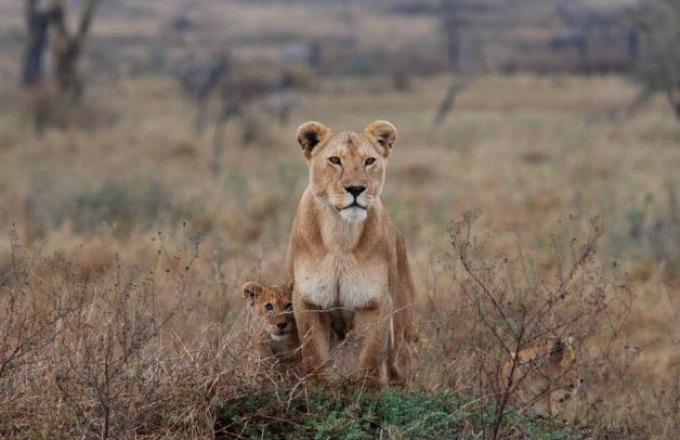 Spectacularly abundant concentrations of wildlife, stunningly beautiful landscapes and vast pristine areas make the Serengeti one of the most exciting parks to visit in Africa. The numbers of wildlife that call this park home are simply staggering. Estimates put wildebeest numbers at 1.7 million, zebras at 250,000, Thomson’s gazelle at 440,000. Also, be on the lookout for lion, hyena and cheetah, as these predators also exist in high concentration on these world famous plains. Arrive at in time for sundowners at the luxurious Serengeti Migration Camp. Hidden among the rocky outcrops of the endless Serengeti plains this luxury camp is a welcome site to unwind, relax and enjoy a sundowner before your evening meal. Each of the luxury tents is surrounded by a 360 degree verandah deck, which creates your very own private sanctuary to enjoy game viewing and the ever present sounds of the African bush. The split level lounge, cigar bar, restaurant, sundecks and swimming pool are perched among the outcrops and overlook the vast and rugged landscape of the Serengeti. Spend a full day exploring the vast Serengeti plains. You will rise early to enjoy an early morning game drive. At sunrise you may encounter animals grazing in the beautiful light of sunrise and predators may still be busy hunting before retiring to rest for the day. Sunrise on the Serengeti is not to be missed and extraordinary photographic opportunities will abound at this magical time of day. You have the option to return to your accommodation for a hot lunch or to opt for a packed lunch which can be enjoyed at one of the various picnic sites found in the Serengeti. After lunch you will continue on a game drive. Around the time of dusk be on the lookout for lion. Cheetah can also be spotted on the plains in the early morning and late afternoon when temperatures are not too high. They rely on daylight and speed to catch their prey. Hippo pods can be seen in the bigger pools and rivers while crocodiles can be seen sunning themselves on the riverbanks. You will return to Serengeti Migration Camp in time to enjoy a sundowner before your evening meal. Guests may find a curious giraffe wandering through the camp and hear the hippos from their watering hole just nearby. After breakfast you will explore the banks of the Grumeti River on a guided game walk. After a leisurely lunch at the Serengeti Migration Camp you will enjoy your very last game drive en-route to the airstrip for your flight to Arusha Airport where you safari concludes. You may wish to include one of our optional activities to your itinerary as your next destination. You might like to do a gorilla trek, or you may just wish to relax and indulge yourself on the white sandy beaches of Zanzibar.